Today it reached 102 degrees today! Have you ever heard of weather like that in Minnesota? After swimming all day on the lake, my sister and her friend wanted something sweet but light. Lemon bars sounded perfect to them! You see.. my little sister and her friend love to bake, but they love to bake with white sugar and white flour. We eat mostly GAPS food around here at my house, so that was not an option for the whole family. They were a little skeptical, but to their surprise these turned out great! They taste just like the unhealthy lemon bars full of sugar. Heres a little secret…they are actually quite healthy! These luscious lemon bars are filled with grass fed butter, raw honey, organic lemons, and lots of love 🙂 These are a must have treat on the GAPS diet. Enjoy! 2. Grease a 9×9 in baking dish with butter or oil <– I use this glass one. 3. Dust the baking dish with almond flour or coconut flour. Those look really good. I’ve only recently heard of the GAPS diet and most of what I’ve heard makes it sound like quite a challenge… I went on a very restrictive diet years ago and didn’t have the benefit of blogs sharing recipes for ways to make it more bearable. Thanks so much for sharing this delicious looking recipe on Food Adventure Friday. The GAPS diet is just an adjustment.With the about of fat you are allowed you can make almost anything taste good 🙂 I hope you look into more because it is very worth it! These look fantastic! Now I’ve never had lemon bars so these would be a first for me… but they definitely look like a must-try… 🙂 Thanks for bringing them to Sugar Free Sunday! My picky sister LOVES these and she LOVEs her real sweets- so i guess these passed the test! Oh, yeah. I’ve got to make that! What a great recipe. I love lemon. Just love it. Oh good I am glad i could help! I love it when healthy is delicious too! It’s lovely to see so many wholesome ingredients in a recipe for such a delicious treat. Mmmm. Lemon flavored desserts are so yummy! And especially refreshing in the summer. Yes they are very refreshing and healthy! I am definitely going to try these out! Caroline, do you have any guidelines about how much coconut flour to use to substitute for almond flour in a recipe like this? I know it won’t take much! I would love it, if you would share this, & any others you may have, on my recipe link up. http://goodrecipesonline.com/organized-linkup-for-all-your-recipes-goodrecipesonline-com/. How were you able to use coconut flour? what were your measurements? I cannot have almond flour yet, but i know coconut flour is so tricky. Do you mind if I pin this on Pinterest? Not at all! of course you can! Made these twice and they are wonderful! Thanks for the great recipe. Caroline, I found your recipe on Slightly Indulgent Tuesday and it sounds wonderful! I will have to try them soon, thanks for sharing. Thanks for reading! 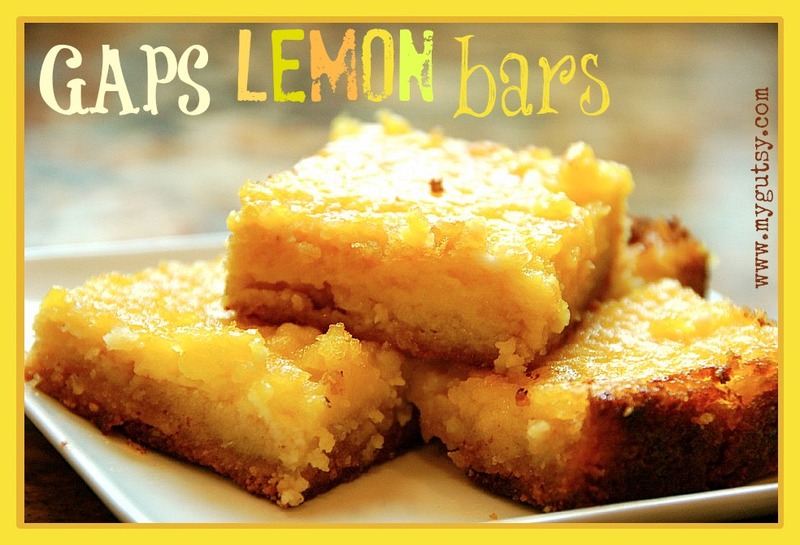 we love these lemon bars too much! Hi Heather! I live W of Minneapolis. There is a yahoo MN GAPS group that is so helpful! I would LOVE to meet another GAPS-ster too 🙂 If you have any requests for recipes, don’t be shy! You can also e-mail me too. Thanks! Good luck to you!!! Hi all. We are finishing up our 11th month on GAPS and also live in MN. We are in one of the Southeastern suburbs of the Twin Cities. I didn’t know there was a MN yahoo group for GAPS. I’m going to join. Thanks for posting that information. ps – I used a coconut flour crust recipe for this from a Paleo website with your lemon filling. It’s all baking in the oven for the 1st time as I type! Going to be a good girl with waiting, and try it in the morning after it has set up overnight in the fridge 🙂 I will have to go brush my teeth so I don’t cave in! You welcome. That is a good idea to combine 2 recipes! I think many people would like a coconut flour recipe crust too. I totally want to try those. My son is allergic to nuts. What other flour would you recommend trying? Maybe a GF baking mix?? HAha, they didn’t eve last 24 hours in our house! For sure! I do that with recipe too sometimes ! I made these today and they were tasty! I will note that I was taking care of a very angry teething baby, and a upset toddler so I burned the edges (that happened quick) but the recipe is great! I did 1/4c honey and 2 squirts of stevia on the lemon part because I am trying ot limit my sugar. Delicious! oh my gosh these look soooo good!!!!!! Truly these lemon bars exceed any others that I’ve eaten. In fact, they are in a class all by themselves. freezer. My husband and I just had the last two with coffee. Mmmmm! yummy recipes. Be Well and enjoy the falling leaves. WOW! You really impressed us this week. You have two recipes in our top 3 reader favorites from last week. Great job. In order to be featured on AFW, however, you do need a link back directly to one of our blog hops. I’ve included my link if you want to use it. Sorry about that Amber, I made these recipes a little while ago and I completely forgot. Thanks for the friendly reminder again! Yeah thats very exciting!! Yes they are zoo good! that is ok to substitute, I’m all about making it work for YOU! These look wonderful, but i am allergic to eggs 🙁 Is there anything i can substitute for them that would work? Thank you! For a substitute mix 1 T of ground chia or flax seeds with 3 TBSP hot water. let it cool and sit in the fridge until it gels and use as 1 egg. though flax and chia are not GAPs friendly. Ive heard you can use gelatin, buy I have never tried. Thanks Caroline! I will try that. I’m new to all of this..are seeds not good? well chia and flax seeds are not allowed on the GAPS diet, but some people can handle a little after a time of healing. Does the 3 eggs include the whole egg including the egg white? Or is it just 3 egg yolks? Would really like to make these and not mess them up. I made these tonight and I have less than 1/2 the pan left–with me eating most of it! Uh oh. Very good! I made these almost exactly as written, but we substituted coconut oil for the butter as we are dairy-free. They are more custard-like, very wet when done, but quite good. I only felt guilty for the calorie intake, not the ingredients as they were pretty healthy overall. I might try coconut sugar or regular sugar next time to cut down on the liquid. Definitely one to make again. Thank you! thank you for the recipie making them for bible study, Love finding ones that accomodate so many different allergies. I added culinary lavendar. I love lavendar and lemon together perfect for spring. I am leaning more and more towards GAPS diet. I know my daughter will probably rebel because I’ve had a hard time keeping her off HFCS and other nasties, but I think if we all try it for awhile it would be a good thing. Thanks for this recipe, it looks very yummy! I’m now following you on FB. Why is there no calorie count to these recipes? Can almond meal flour be replaced with Hazelnut flour? I live in a hazelnut growing area and see the flour at the produce market. Can you please tell me how many carbs are in the lemon bars. I’m pre-diabetic and have to stay somewhat low. Thank you! I’d love to try these bars! And I think I will throw in some cherries for a colourful holiday twist. I have returned to this recipe countless times and it’s always a hit for even all my sugary friends and family! Making them for Father’s Day weekend. Thank you for sharing your recipe with us!